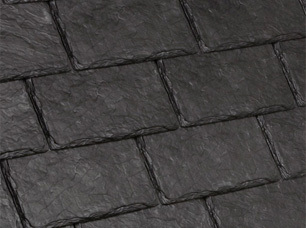 If your home is not built to withstand the weight of a stone slate roof, a beautiful option is Synthetic Slate. It is difficult to the untrained eye to see the difference from a distance. When you want the beauty of your roof to compliment your home, using a synthetic slate is a preferred choice over wood shake shingles due to the flammability of wood shakes. Beware of the type you choose. There are some synthetic roofing slates on the market with warnings of cancer causing ingredients. DACA chooses a safe and healthy synthetic slate with a proven track record.